Cotton & Khadi: The most suitable and favorite dress material is cotton and Khadi. This is very common fabric on India and many hot countries around the world. The cotton dresses are cheaper, available in many varieties, absorbs moisture quickly and evaporate quickly. The cotton materials are easily washable and most preferred dress during hot summer. Avoid heavily embroideries, stonework thick dress materials during summer. This makes you more uncomfortable. Always wear loose garments and clean inner garments. To have more air circulation, Linen cloth dress were suitable during the summer. These linen materials are available with different designs and colour to suit your taste. The Aloe Vera and Lemon paste are excellent natural cream to keep your skin protected. The Bleaching rich agent, high Vitamin C, with an antioxidant from lemon helps to glow your skin. The Aloe Vera, the short-stemmed succulent plant that produces antiseptic gel is the natural skin shine. The mixer of Lemon juice and Aloe Vera gel keeps your face shining and glowing during the summer. This is all time skin cream. The gram Flour with Curd face pack – it is another natural face pack with a combination of whitener and deep moisturizer. The gram flour, clean up your suntan from the skin and helps to glow brightly. The Calcium rich curd with the quality of exfoliating removes the dead skin or suntan and brings back your shining skin. Apply the gram flour and curd pack on your face, neck, and hands then allow drying for 15 to 20 minutes. Wash with warm water, your feel surprise to see your glowing skin. You can add few drops of lemon juice also. 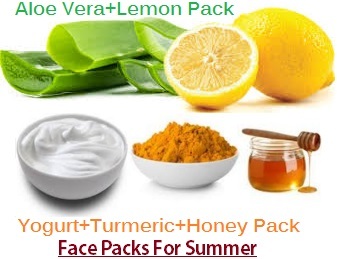 Turmeric, Honey, and Yogurt pack – It is another homemade pack during summer to protect your skin. The turmeric known for its antiseptic quality and disinfectant cures small cut, burns or any infection. The moisturizing Honey, gel textured Yogurt mixed with Turmeric powder, helps to retain the skin quality and sparkling way. The 25 ml of lemon juice or one full lemon juice, add 100 to 125 ml of ice water. Adds sugar or salt to taste and service with ice cubes. Three glasses of lemon juice in a hot summer day bring back your energy. The natural, unadulterated health drink is Tender coconut. One tender coconut one day is enough to cool your summer hot days. Watermelon Juice- Take one full watermelon and remove the skin and seeds. Juice it in a Juice maker; add litter sugar to taste and pinch of pepper. Keep it in the refrigerator, service with love and affection, which keeps you and family cool. Mint or Pudina leaves is another good herb, which can add any of the above juices. As a precautionary, take an umbrella or hat to protect your head, sunglasses for eyes, cotton dress, and handkerchief or tissues to wipe sweating Avoid outing during 11 am to 3 pm, this the peak period of hot sun. Drink one glass of hot or warm water in the morning, noon, and night to keep away your thirst. Let us celebrate the hot summer with cool way. Why should I have Breakfast?